Wednesday, I with members of the Texas National Guard’s 36th Infantry Division, who recently returned from a year-long tour in Southern Iraq. Members of the division shared their observations on the current situation in Iraq and National Guard operations and deployments. Brigadier General William Smith, who serves as Commander of Domestic Operations for the Joint Forces Headquarter of Texas, is a constituent of mine in the 21st district. The men and women of the Texas National Guard 36th Infantry Division deserve our deep gratitude for their service to our nation. As President Obama withdraws our troops from Iraq, it is critical to hear their perspective on the capabilities of the Iraqi Security Forces and Iran’s influence in spurring insurgency there. As our brave military members return home, we must work to ensure that they receive our full support and that their gains in Iraq are not reversed. Also this week, the House passed the National Guard and Reservist Debt Relief Extension Act to help members of the National Guard and Reserve obtain bankruptcy relief if needed. The measure was approved by the House Judiciary Committee in September. **A photo of the meeting is above. 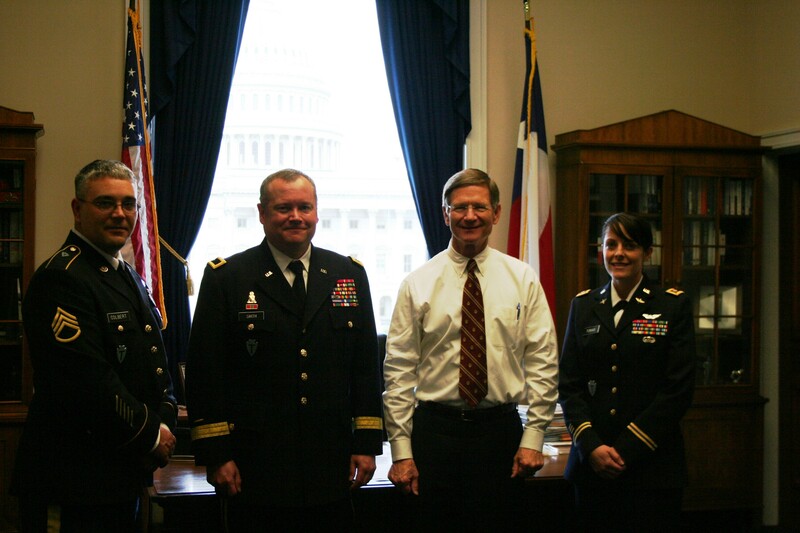 Pictured with Congressman Smith are (from left to right) Staff Sergeant Jason Colbert, Brigadier General William Smith and Major Jana Tobias.